The butter, and margarine, that we use today is just plain dull and ugly. It's either just a cuboid (a 3D rectangle), if its what we call 'stick' butter or a truncated cone, if it's what we call a 'tub' of margarine. Either way, the sides of these three dimensional shapes are usually (as far as butter and margarine are concerned) flat and unadorned ~ hence, ugly. 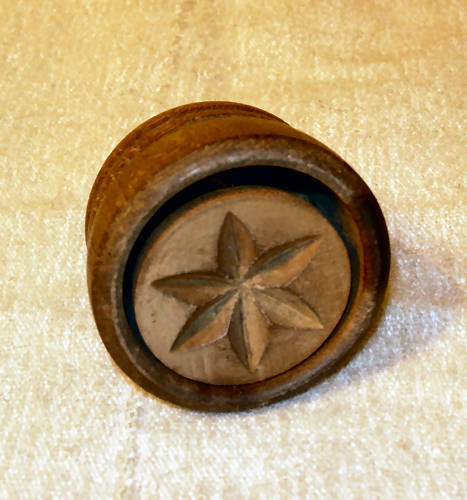 During the Colonial Period, butter was a delight to look at ~ at least when it was first made ~ because it was pressed with a low-relief pattern or design. Butter was made by most homesteaders by the following process: Milk would be collected from cows or goats and the cream would separate from the fresh milk simply by letting it sit for a while in a pan or shallow dish. The cream would rise to the top of the milk, and then it would be skimmed off and placed in a crock. The cream would be set aside in a cool place (such as a pantry or a spring house) for at least twelve hours to allow the butterfat in it to crystallize. This would make churning it a bit easier. Sometimes the cream would be set aside for a couple days ~ as additional cream would be collected over the period of those couple days, making the amount for churning more substantial. The cream would then be poured into a churn, and continual stirring and pounding would result in butter solidifying. 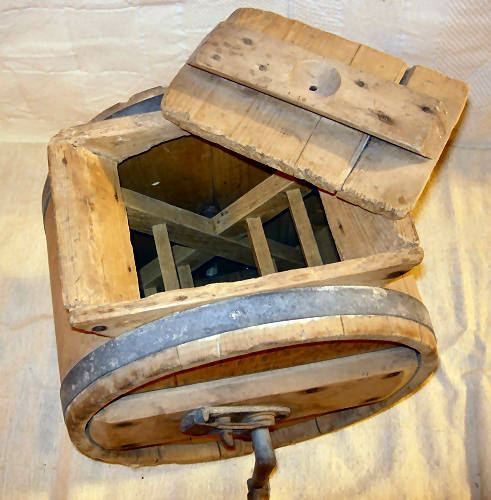 The photos above show an upright or plunge churn with the plunger, sometimes called a dasher, exposed. 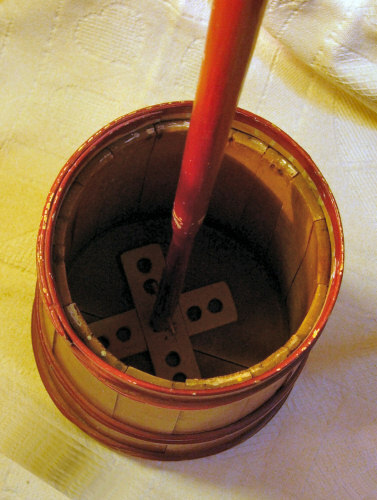 The barrel or paddle churn was another type of churn in which the cream was agitated by a set of paddles inside a barrel shaped body (as shown in the photo below). In addition to the soft mass of butter that was formed, there would be some liquid remaining, which did not solidify. That liquid is what was called buttermilk. The butter would be removed from the buttermilk in the churn, and it would be washed off in cold water to remove any remaining buttermilk. 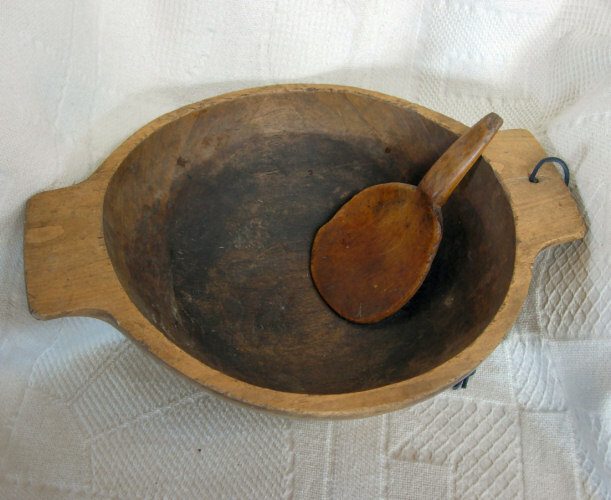 Then the soft butter would be placed in a wooden bowl and the person making the butter would knead it, folding it over on itself continually by using a wooden paddle. At this point, a little salt would be added to the soft butter, so that it would get thoroughly mixed in the kneading process. As the soft butter would be kneaded, any additional moisture would be squeezed out of the mass. 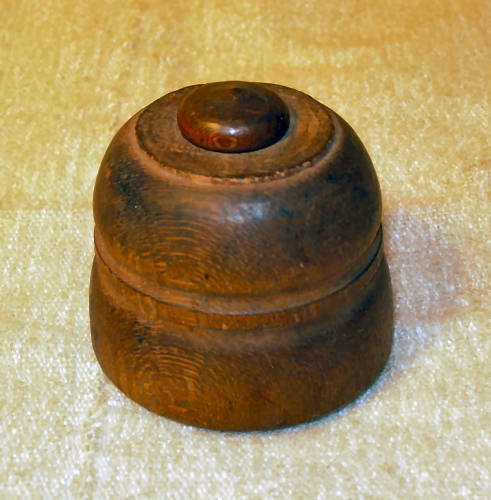 It was then ready to be pressed into nice conical shaped brick or block. 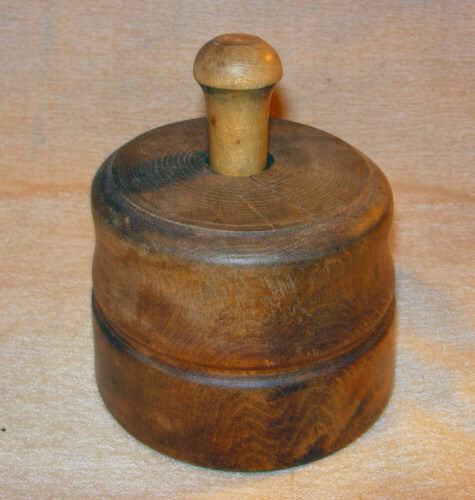 This was accomplished by sprinkling a little flour into a wooden, plunger-type butter mold (so that the butter would come out more easily), then packing it tightly with the freshly kneaded butter. The 'top' of the butter would take on the low relief design of the butter mold's face. 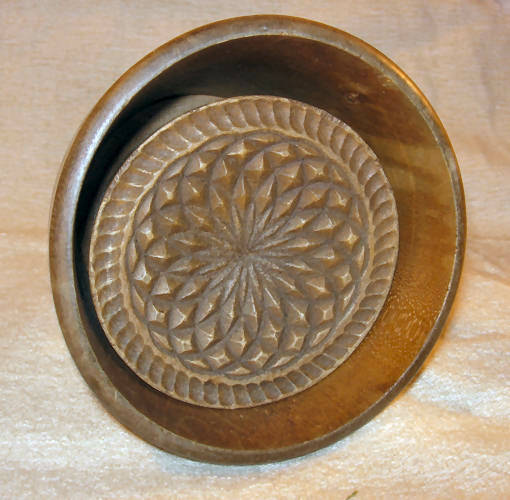 The plunger on the butter mold would be pushed, resulting in the block of butter being pushed out of the mold, nicely shaped with the carved design on its top. 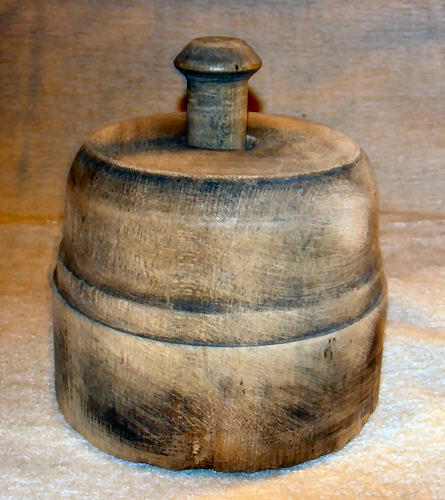 The larger butter molds tended to provide a one or two pound block, while there are rather small butter molds designed to provide a small, individual-serving sized tab. The mold shown directly below is one of the small ones, it is shown a little larger than actual size. 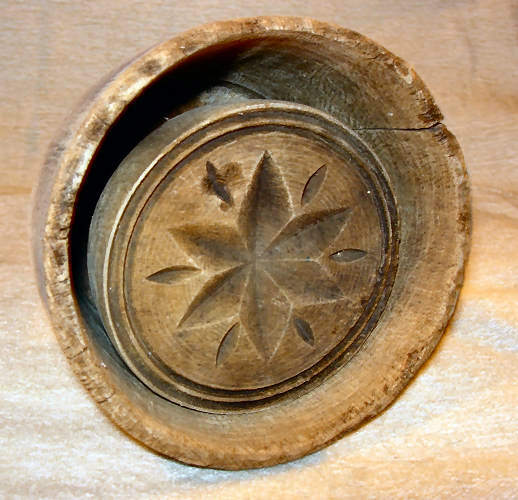 All of the rest of the molds shown here are larger ones, measuring between five and six inches in diameter. 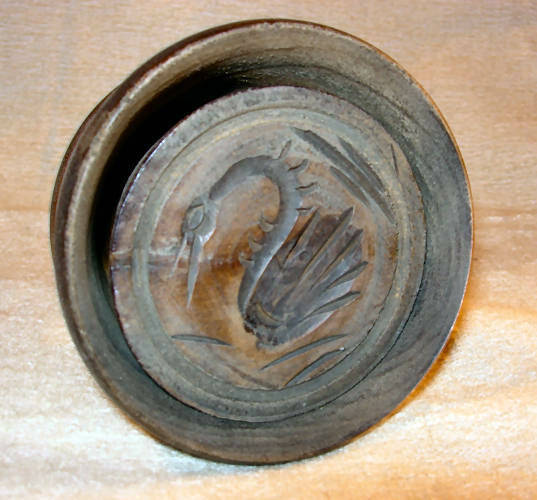 As the photos show, the patterns on butter molds tended to be geometric, but some molds, such as the one shown below showing a swan, were of birds and other animals. It's a shame that we don't use butter molds to decorate our butter nowadays. Instead, we're stuck with ugly butter ~ or worse, tasteless margarine.